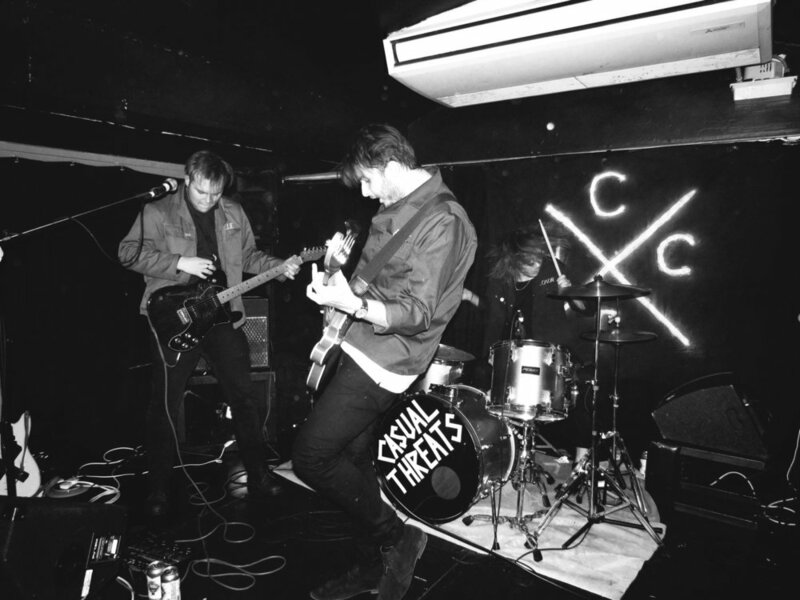 After a 4 month hiatus, Casual Threats made a surprise return that has created a wave of celebration in the local scene. Playing an exuberant opening set supporting Tiny Minds it felt like these 3 lads had never been away, even throwing in two new tracks among their set of classics, including their hugely successful pop-punk banger 'Hate' which had multiple Radio 1 airplays last year. Firstly, it’s so good to have you guys back on the scene! Could you tell us a bit about why the initial hiatus happened, and most importantly what brought you back? Ollie: Well, what happened is that we all fell out with each other. Baz: We’d been playing together for a while and had differences of where we wanted things to go. We all just needed some time away from it and do the things we each wanted to achieve. Ollie: But it turns out what you want to achieve is unrealistic, so what you do is you start playing music for the fun again. Baz: And then we had two gig offers for Casual Threats and that's really what got us back into the practice room and having fun. who messaged me and said she was looking for more alternative bands on the scene to put on, as there had been a lot of gigs repeatedly featuring the same bands. So we thought: “Well we better get back together then!” But prior to that I think we suffered as we were starting to write songs just to please other people and with the aim to be on the radio. But then you actually ended being played on the radio! Baz: Yeah, just as we had all fallen out with each other we ended up on the radio! Conor: Two weeks after we had fallen out Baz contacted me to say we had had an email from Huw Stephens to say we had been played on Radio 1. And then for 3 weeks it kept on happening and we kept on getting this email. Baz: Yeah, it was when we made Huw’s 'Best Of the Month' Playlist. Ollie: Mate, it was 'Best of 2017'! Conor: We only found that out as we tried to find the program we’d been on. We googled “Casual Threats Huw Stephens” and stumbled across the 'Best of 2017 BBC Introducing Playlist'. Ollie: And all that just because I wanted to show my mum! But 'Hate' has definitely got a more commercial sound from your mini-album 'Life From Below'. How did that come about? Baz: The story is, Ollie went travelling around Europe with his friend Josh. They took along their acoustic guitar and one night they challenged each other to play a song about “X”, and Ollie got hate and just came up with this song. When he brought it into the practice room he was like “Look I played thing song on holiday, and it’s a bit daft but I think it could work”. At the time me and Conor were listening to a lot of pop music and Don Broco, so for us it felt it fitted with we are listening to and really latched onto it. It brought the pop sensibilities home a little. You’ve played some new tracks tonight though which sounded heavier again? Conor: Yeah, we have rather self-indulgently gone back to doing what *we* want to do. Off the back of 'Hate' we had rewritten one of the first songs we’ve ever written called 'Docklands Light Railway' which originally was very flat all the way through. Baz: When we first wrote it we were trying to be like 'Yourcodenameis:milo', but now we’ve found where we want to be and have thrown in some influences like Bloc Party and The Bravery. What we want to get is a mix between our Bruce Springsteen-y songwriter side and something you can just dance to. Ollie: That was the case for the other new track we played tonight. I originally wrote it for writing sake, and when I brought it to these guys I said: “oh I’ve got a song about a Canadian Au-pair that I loved and broke my trust”. Baz: He had reason to do that by the way, but the history of which we probably shouldn't put on record. Ollie: So, the first practice we had when we got back together we were talking about lyrics and how I wrote them. Baz was telling me how I always wrote short, sharp statements that I’d embellish. I awkwardly took that as a snide at my songwriting ability, so I went away and wrote a proper “story song”. Baz: What he wrote as a result was really fun and something different that we normally play and me and Conor really latched onto it. So you were the opening act tonight but for us it felt a lot more than that and you were really well received. How did it feel for you? Ollie: Yeah it felt intense. Conor: We felt nervous. We had gotten so familiar with the same sets and the same songs that we could do them inside and out. But having then written a couple of new songs and essentially taking four months off we absolutely hammered rehearsals in preparation. I’ve never rehearsed so much. And given that these guys live like an hour away from me we really had to pull together. But it was cool, it was really well received, especially the new stuff. Baz: It’s gone down a lot better than I thought it would. I was a little bit apprehensive about us dropping two new songs on the same night at out first gig back. I got the vibe tonight that not a lot of people really knew our catalogue besides 'Hate', but everyone just took to every song which was really nice. Ollie: We should have played a song called 'Guto Bebb MP', it’s an absolute banger. Baz: We’ve written 3 new songs, two of which we played tonight and the 3rd one is called 'Guto Bebb' after the minister for the interior. We didn’t play that tonight but we’re bringing it to the next gig. I'm fairly confident it’s a solid tune but I think we just needed a bit more practice on it. So we’ve already talked a little bit about 'Hate' but I really want to talk about the video. Who came up with that brilliant one-shot concept idea and how many takes did you have to do? Ollie: That was Conor’s dream. Baz: Generally on the creative side of things we let Conor handle it, but I like to chip in with things every now and then. Conor told me: “I wanna do this thing where it’s a one take”, and I was like “what, like an Ok Go video?” and he was like “yeah kinda like that” and I was like “I’m sold!”. Conor: We did the 'Suarez' video using Premiere Pro 10 and it took me 10 hours to do. It was horrible. So for 'Hate' I wanted something sharp and fast. And then I had the idea of doing a one take video. It came to me in the shower...not a group shower! Baz: We do shower together. Conor: We shot the video where I live with the help from my housemates, Baz’ girlfriend and a few others behind the camera. We did only one dress rehearsal as we were limited on party poppers. Baz: When you're limited by party poppers you know it's gonna be a decent video. We did a dry run and literally had Conor’s housemates picking up the poppers shouting “pop”. Conor: I took us 20 minutes to film the entire thing. And for the editing, because it was shot in time, we literally just had to put in in the computer. Yeah, so that was the 'Hate' video. So looking ahead, what else have you got coming up? Ollie: We have a gig coming up with Massa Confusa and Mouses at Little Buildings on the 30 March. Conor: Yeah and Ghost Signals, who we are good friends with, have invited us to play with Pet Crow so that's gonna be fun (Little Buildings - 17 February). Also, we are gonna put out another song and announce another show in Stockton, but we are still confirming details for that.